Absolute Return Partners is a London-based investment advisory business. Founded by Niels Jensen in 2002, it focuses on providing bespoke alternative investment solutions to institutional investors. In total, it manages over $600 million of assets across the group. Why it is so important for productivity to grow briskly? 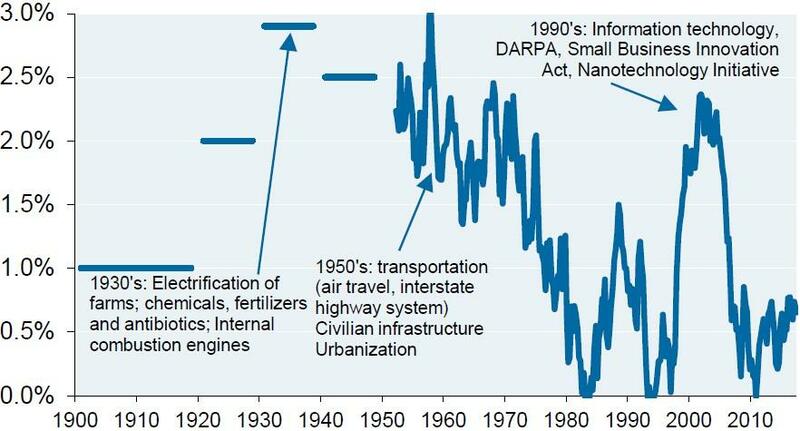 Productivity in a historical perspective. Americans can teach Europeans one or two things. So much capital is misallocated these days, and that continues to drive down trend GDP growth. For those of you not familiar with the term misallocated capital, let me briefly explain what it is. The term is used by economists to describe capital that is deployed without having any impact on productivity, i.e. capital that is deployed unproductively. 1. Ageing of society at large, as older workers are less productive than their younger peers. 2. The rising cost of servicing the elderly in society. 3. Excessive indebtedness in all economic sectors and the rising cost of servicing that debt. 4. The rising cost of producing the energy we need to spin the wheels every day. 5. The fact that the savings freed up by the digital revolution have not been re-invested in reskilling the workers affected to a higher level but have instead been pocketed by capital owners. Productivity agents 2-4 all have to do with the rising amount of capital being deployed unproductively - capital that could, and ideally should, have been used to enhance productivity. All that misallocated capital is holding back GDP growth, and it is a topic close to my heart, as I believe a return to the productivity levels we enjoyed in the early years of the digital revolution, when the internet was first introduced, is key to respectable GDP growth going forward. Economic growth is so important if we want to stand a decent chance of coming out of the current debt crisis without too much damage, as we simply cannot service all the debt we are saddled with unless GDP grows briskly. If I tell you that ∆Workforce will turn negative in many developed countries in the years to come, I am sure you'll understand why robust productivity growth is pivotal to economic growth. As is obvious when you look at Exhibit 1 below, since World War II, the US economy has only enjoyed two longer-lasting periods of productivity growth in excess of 2% per annum, and the same is true for most of the rest of the developed world. The first unfolded from the mid-1950s to the mid-1960s. Eisenhower had returned from the war in Europe and told Congress about a German phenomenon called autobahns, which allowed Hitler to move his army swiftly around. Congress subsequently decided to establish the interstate highway system. At about the same time, commercial aviation took off (no pun intended! 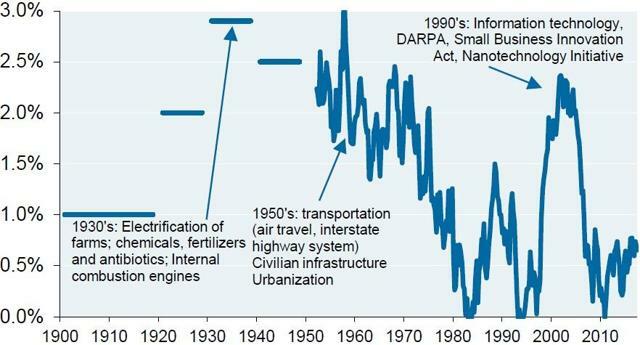 ), and the two new modes of transportation had a meaningful impact on labour productivity over the subsequent 10 years or so. The second wave of strong productivity growth occurred in the early years of the digital revolution. The internet had just been rolled out, and that had a similar impact on productivity. Now, as we are entering the second stage of the digital revolution (advanced robotics, AI, etc. ), the comment I constantly come up against when I point out that a declining workforce will most likely lead to depressingly low GDP growth is something along the lines of "don't you worry - productivity growth will take care of it." I am not so sure, which is the point I tried to make in the October Absolute Return Letter. Fast forward a few months, and a paper called Negative Productivity Agents authored by J.P. Morgan Asset and Wealth Management landed on my desk. A client of ours, who is aware of my passion for the topic, kindly sent the paper to me, and my intention is to share its findings with you today. Before going into the paper in more detail, I should point out that, despite J.P. Morgan dealing exclusively with the negative productivity agents that are holding US GDP growth back, one could probably assemble a similar list for most other countries. It is only a question of digging deeply enough. Now to J.P. Morgan's work. A combination of a massive war machine (which many other countries have benefitted from, I hasten to point out), an outdated infrastructure, various behavioural quirks, high healthcare costs and a dysfunctional legal system are all listed by its researchers as reasons why the second stage of the digital revolution may not have quite the impact on productivity that (nearly) everyone expects. What comes across in the following might be seen as an anti-American tirade, but nothing could be further from the truth. Although I am admittedly not a great admirer of the current tenant in the White House, I believe the Americans can teach us Europeans one or two things. Furthermore, I am only the messenger, and the last time I checked, J.P. Morgan was still an American bank. With that in mind, let's jump straight in. Some wars that the US military has been involved in have admittedly improved prosperity whereas others have not. Whatever way you look at it, though, it is an undeniable fact that the US war machine is very expensive to run and siphons capital away from productivity-enhancing investment opportunities like education and infrastructure. 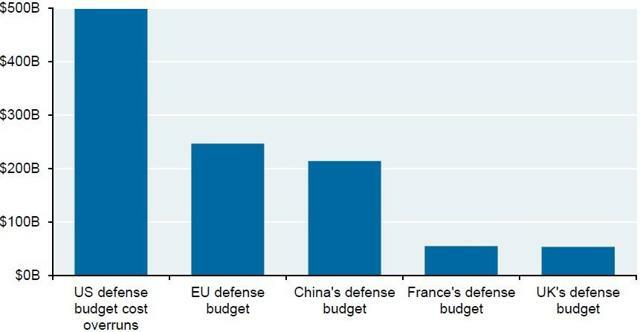 What I find particularly revealing is the fact that the US defence budget overrun only a few years ago exceeded the entire defence budget of one of its supposedly biggest security threats - China (Exhibit 2). Source: J.P. Morgan Asset and Wealth Management. Data as of 2015. You may recall that one of the eight structural megatrends which we have identified at Absolute Return Partners, and which we believe will define the world in the years to come, is a theme we call Electrification of Everything. (You can see all eight megatrends here). Governments all over the world are determined to electrify virtually all heating and transportation as the fight against global warming continues. Rising electrification will affect economic growth as well as financial markets, and it will make us less dependent on environmentally very unfriendly fossil fuels such as coal, oil and gas. Now to the bad news as far as the Americans are concerned. Electrification of everything will only work if you have a reliable electricity grid, and the American grid is near the bottom of the international league table in terms of reliability (Exhibit 3). Significant investments to upgrade the grid will therefore have to be sanctioned before the US economy can take full advantage of Electrification of Everything. I could list several other infrastructure issues but would suggest you read the whole J.P. Morgan paper if you want to dig more into the topic. You can do so here. Let's instead move to some of the behavioural quirks listed by J.P. Morgan. How many Americans do you think have been killed by firearms in the last 50 years? I was truly shocked to learn that the number (including suicides) amounts to more than 1.5 million. That equates to more than 30,000 gun-related deaths every year. In 2017 alone, 40,000 people were killed by guns and that number does not include suicides, so the problem is not exactly going away. The US is quite simply in a league of its own when it comes to gun ownership and gun-related deaths. The reason this is relevant vis-à-vis productivity is the vast amount of money spent by the Americans every year on dealing with gun violence - money that could (and should) be spent on educating our youngsters instead (Exhibit 4). I note that we have a not too dissimilar problem here in the UK where a growing number of (mostly young) people are stabbed to death every year. Only a few days go by now without another person being killed, and a dysfunctional parliament does virtually nothing. The absolute numbers are still far from US gun-related killings but, when Westminster eventually wakes up, capital here in the UK will also be siphoned away from productivity-enhancing investments like education and into dealing with this problem. 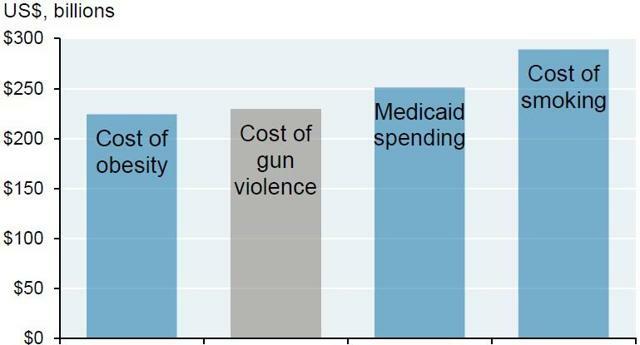 Whether you are in favour of the current US policy on gun ownership or not, it is an undeniable fact that it is a very expensive policy for society at large, outstripping even the cost of obesity which is not exactly a small problem over there (or, for that matter, anywhere). When I was admitted to a hospital in Texas in August 2016, whilst I was (and still am) in awe of their approach to severe head injuries like mine, which is lightyears ahead of anything on offer here in Europe, I was struck by how big the food portions were. Every day, I was offered what could easily serve a family of four here in Europe. No wonder obesity is a problem. Gun crime, obesity and other behavioural quirks combined with ageing of the populace at large continue to push US healthcare expenses through the roof (Exhibit 5). Having said that, as you can also see when taking a closer look at Exhibit 5, US public healthcare expenditures are not miles away from the cost of providing public healthcare in Western Europe. In other words, it is the US healthcare model, which is based on private care paid for by insurance companies, that is the likely culprit. I am under no illusions when it comes to changing the US healthcare model, though. The average American will probably think it is a step towards socialism to replicate the European healthcare model. As long as that is the prevailing view, nothing will change, even if the implication is that a serious amount of capital is misallocated every year. 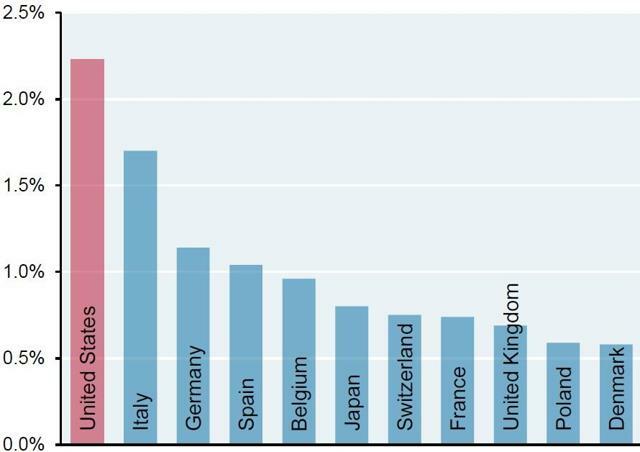 The last negative productivity agent I will share with you today is the excessive level of corporate litigation costs in the US when compared to other OECD countries (Exhibit 6). Why does this matter to the man in the street? Because excessive litigation costs siphons capital away from potentially productivity-enhancing corporate investments which could benefit us all, with the money instead spent on protecting corporates from ridiculous lawsuits. Back in October 2010, Dietmar Meyersiek wrote a very interesting paper for Woody Brock ("Incentive Structures and Economic Growth", Strategic Economic Decisions, Profile No. 102. ), where he looked at the link between economic freedom and economic prosperity (Exhibit 7). As Meyersiek said, superior economic growth is very much affiliated with greater economic freedom. In other words, productivity can be dramatically affected by the extent to which you regulate. 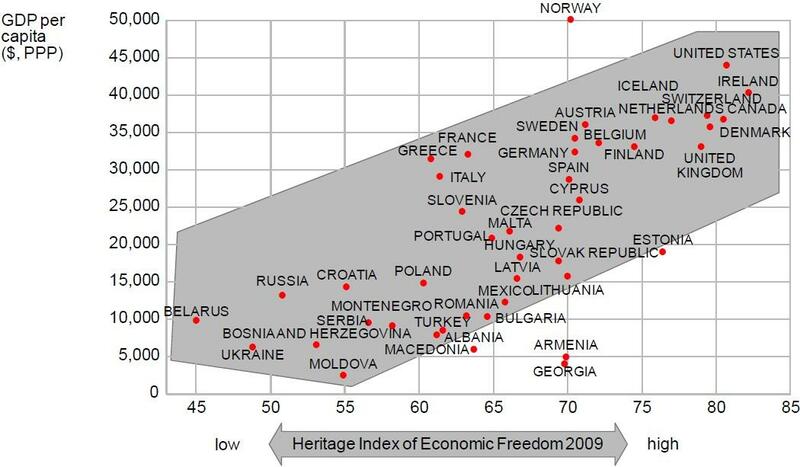 Meyersiek based his conclusions on work conducted by the Heritage Foundation which defines economic freedom as business, trade and investment freedom, financial and fiscal freedom, size of government, monetary freedom, property rights, freedom from corruption and labour market flexibility. My point is quite a simple one. Although this month's Absolute Return Letter has focused on some of the negative productivity agents impacting productivity in the US, it is still a very free economy; hence you should expect economic prosperity to prevail over there, and that is precisely the conclusion I draw when looking at Exhibit 7. Meyersiek's findings also imply that even if there are plenty of negative productivity agents in the US, there are probably even more in Europe. Let me give you just one example. In 2009, the EU Parliament passed a new law regulating the shape of bananas. Those sorts of laws are silly. They offer nothing in terms of consumer protection, but they add to the costs of the corporate sector. In other words, they impact productivity negatively. Even worse, they turn so many people against the EU, as we have learned here in the UK over the past few years. That said, don't get me wrong - I am by no means against all regulations, with the next industry to be regulated in this country most likely to be the social media industry. The day that happens, I will probably open a bottle of champagne.